Allegations of scientific misconduct in missile defense at Lincoln Laboratory remain under review by the Institute. A panel chaired by Associate Provost Canizares has been charged with investigating the policies and procedures that complicated the case and recommending changes to avoid similar incidents, President Hockfield told the faculty Wednesday. Hockfield is participating in discussions “at a very high level” with the Department of Defense regarding a possible investigation, she said. A feature in Sunday’s Boston Globe Magazine will address the misconduct scandal. An overhaul of the student discipline system was recommended by a special committee and presented to the faculty Wednesday by Chair of the Faculty Lorna J. Gibson, who chaired the committee. The committee’s report focuses on maintaining a single procedural pathway for all disciplinary complaints. 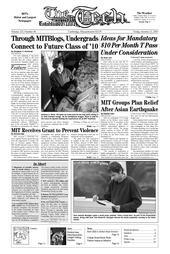 The report is online at http://web.mit.edu/dept/libdata/libdepts/d/archives/facmin/051019/0510b.pdf. The report’s procedures would replace the current practice, now documented at http://web.mit.edu/committees/cod/. MIT received a $25 million gift to endow undergraduate financial aid from an alumnus who wishes to remain anonymous. President Hockfield announced the gift during Wednesday’s faculty meeting. Rebates for Harvard-MIT Coop members increased 20 percent from last year to 7.3 percent. The 41st Head of the Charles regatta will take place on Saturday (9:30 a.m.–4:30 p.m.) and Sunday (7:45 a.m.–5 p.m.) on the Charles River. Viewing is especially good from the BU and Harvard bridges at mid-day. Expect traffic delays in Cambridge. http://www.hocr.org.